Cardinal Scale’s powerful WinVRS has been a popular vehicle recording system for truck scale weighing applications many years, allowing high-traffic applications fast, accurate collection of data on vehicles, accounts, orders, and materials. With 9 models of WinVRS to select from, customers often have questions about which system is right for their particular application. To help explain in an easy-to-use format, we have created the WinVRS Models Comparison Guide, which is available in the link below. The chart helps specify the differences with each particular model. 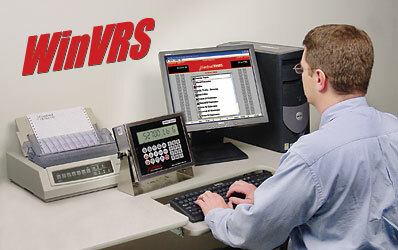 Programmed completely in-house by Cardinal software programmers, WinVRS is all-Cardinal and all-USA-made. WinVRS has been time-tested and a popular add-on to Cardinal truck scale orders for many years! Cardinal’s powerful WinVRS software keeps traffic moving over your scale by providing fast, accurate collection of data on vehicles, accounts, orders, and materials. Unique, user-defined fields allow you to easily configure the system to meet your needs. A wide range of reports are available to provide period histories, material totals, customer information and more. WinVRS’s convenient file utilities menu allows data to be exported to other applications such as accounting and materials control. NTEP legal-for-trade certified. WinVRS-TOUCH offers all the same great features as WinVRS, but comes with larger fonts and buttons for convenient touchscreen navigation. When a user enters into any WinVRS window with input prompts, an on-screen keyboard appears.